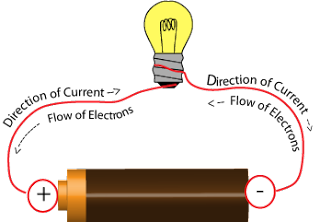 Electrical charge is a fundamental quantity and is intrinsic property of matter which causes a force to act between particles (objects, bodies..) which have this property. It is physical quantity which can be transferred from one object to another. Electric charge comes in two types, which wechoose to call positive charge and negative charge. when charges are transferred by simple interactions (i.e. rubbing), it is a negative charge which is transferred, and this charge is in the form of the fundamental particles called electrons. The charge of an electron(e) is -1.6022 × 10-19 C.
q = ne where n = 0, ±1, ±2 . . .. Because of this, we say that charge is quantized. 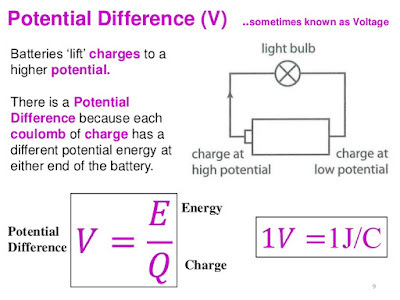 A charged object is an object that has an excess of one type of charge, e.g., more positive than negative. The amount of excess charge is the charge we assign to that object. Flow of charge moving through unit area in unit time. It represents charge transfer. Voltage is a measure of the energy carried by the current. Technically it is a measure of the difference in energy between two points – hence the name potential difference. Voltage represents potential difference between two points. It represents work to be done to move unit charge from one point to other under influence of electric field.